First you are greeted with a beautiful vase of fresh cut flowers, a luxurious bathrobe, and a hot cup of herbal tea or fruit infused water. You will receive a professional skin analysis and face mapping followed by a relaxing one-hour Deluxe European facial. Your feet will also be pampered as they are wrapped in aromatherapy towels. Lastly, you will receive a Dermalogica skin kit customized just for your skin type. With this package you receive everything in the Pamper Me Package plus you will relax even more with a 30-minute reflexology massage on your hands and feet. The name says it all! You will be treated to hours of total bliss!! First you are greeted with a dozen roses, a luxurious bathrobe, and a welcome basket loaded with spa goodies. You are then given a professional skin analysis and face mapping followed by a one-hour Deluxe European facial. For extra warmth and comfort, aromatherapy towels will be wrapped around your feet. Next you will enjoy a 60- minute reflexology massage on your hands and feet. You will then be served a gourmet lunch which includes a bottle of champagne or sparkling cider, and dessert. After lunch you will be pampered even more with a one hour back facial. 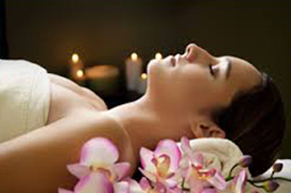 This package will leave you totally relaxed and rejuvenated. This package is what every woman dreams of. You will feel like a queen for sure. This packages includes everything in the Spoil Me Rotten Package plus a 60 minute full body massage. You may never want to return to reality.